Join Syracuse Animal Rights Organization for what marks three years of encouraging L’Adour to drop the cruel product called foie gras. Thousands of ducks are force fed with rigid tubes 3 times a day to produce this delicacy, which is the diseased, fattened liver of a tortured animal. 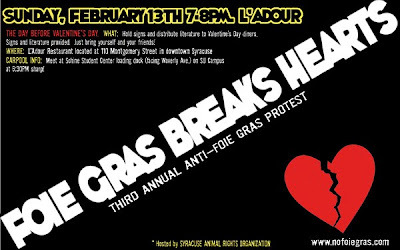 Visit nofoiegras.org for more information about foie gras as well at ladourpollutes.com for more information about the environmental impacts of the foie gras industry. What: Hold signs and distribute literature to restaurant goers and passerby on the Sunday before Valentine’s Day- should be a busy night. Dress warmly! We will be standing outside for an hour- hats, gloves, long-johns recommended! This entry was posted in Uncategorized on January 19, 2011 by saro.